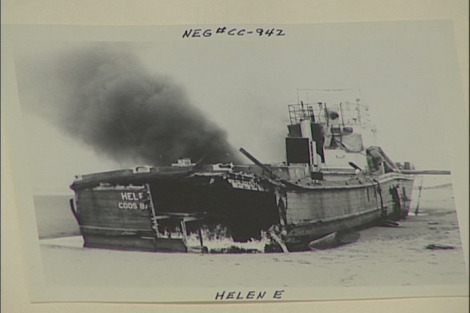 Experts believe the last time anyone saw the Helen E was in 1951. After seven days at sea, the 107-foot fishing vessel ran aground on the North Spit of Coos Bay, during a fierce storm while looking for a port to pull into. Its parts were scrapped, a portion was burned and it was left for dead, slowly being covered up by sand. But now, almost 60 years later, what's left of the wreck is coming back to life, so to speak. "I first saw some ribs sticking up and they looked like they had to be part of a ship. I became more and more curious as to what it was, when it sank," said Coos Bay Resident Larry Plews. He was the first to see a part of the Helen E sticking up out of the sand around Thanksgiving, and by mid-December, its remains were almost completely exposed.